24 PCB007 MAGAZINE I JANUARY 2018 Feature Article by Alex Stepinski WHELEN ENGINEERING COMPANY Background In 2014, Whelen Engineering Company, the OEM market leader in the emergency warn- ing industry, developed the world's first green smart PCB fab factory as a captive operation servicing internal demand. Due to the success of this venture, in 2016, a decision was made to explore building an upgraded factory which would serve the merchant market. This arti- cle outlines the approach we took to designing this new phase of our commercial existence, which has now been spun off as a separate business unit known as Greensource Fabrica- tion. This new business unit is expected to go live in 2018. 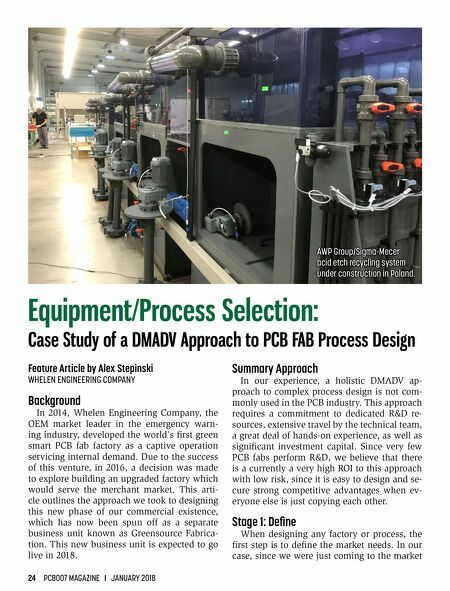 Equipment/Process Selection: Case Study of a DMADV Approach to PCB FAB Process Design Summary Approach In our experience, a holistic DMADV ap- proach to complex process design is not com- monly used in the PCB industry. This approach requires a commitment to dedicated R&D re- sources, extensive travel by the technical team, a great deal of hands-on experience, as well as significant investment capital. 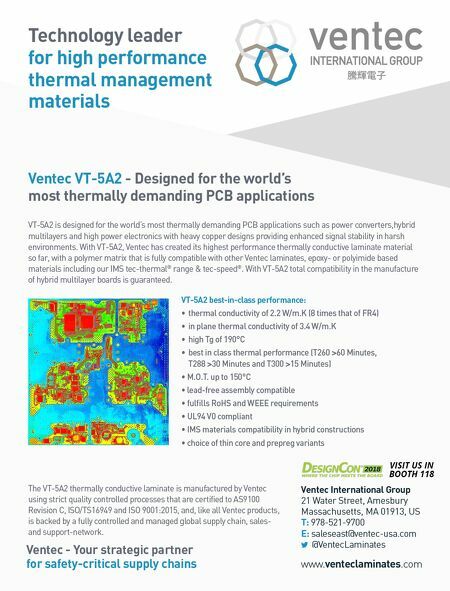 Since very few PCB fabs perform R&D, we believe that there is a currently a very high ROI to this approach with low risk, since it is easy to design and se- cure strong competitive advantages when ev- eryone else is just copying each other. Stage 1: Define When designing any factory or process, the first step is to define the market needs. In our case, since we were just coming to the market AWP Group/Sigma-Mecer acid etch recycling system under construction in Poland. Column — New Year, New Equipment—Right?